8/27/18 Tasty Tuesday: Hot Dog! It's Louis Tomlinson! Louis has come a long way since eating hot dogs at the VMAs. Louis recently talked about how X Factor changed his life. “On the first day it was as surreal for me as the contestants auditioning. It was a proud moment for me, definitely. X Factor starts September 1 and 2 on ITV and September 2 and 3 on AXS in the US. Louis Tomlinson has been assigned to look after the Lads this year for his X Factor judging category. He'll be picking from the Boys for the Six Chair Challenge, which is filming over the next few days. The contestants are split into four different categories and assigned a mentor for the show. With Louis mentoring the boys, Simon Cowell has the Girls, Ayda Field has the Over 30s, and Robbie Williams has the Groups. During the Six Chair Challenge the contestants narrowed down to six per group. Each contestant sings in front of judges and audience. Each mentor then decides if they deserve one of six seats, but they could be knocked out if their mentor decides to replace them with a subsequent performer that the mentor likes better. The six left in the chairs at the end win a spot at judges’ houses, the last stage before the live finals. "If the judge likes an act enough and they definitely want to see them at judges houses they’ll press this golden X and give that act a Safe Seat. Roycey started the day joking that Louis looked like he was "off for a run". Louis was clad in a Cottweiler Signature 3.0 satin-trim jacket ($460) and track pants ($345) with blue and green stripes and Balenciaga Speed Knit Sneakers. Today was Yorkshire Day and Yorkshire's own Louis was in rare form. "I am proud to be a Yorkshireman with you," he told a contestant from Yorkshire. An exuberant contestant celebrated the day by running on stage saying, "It's Yorkshire Day! Yorkshire Day!" to which Louis stood, smiled, and waved his arm, saying "Yes, Lad!" Louis also wished a 'appy Yorkshire Day in a video message posted by Roycey the warmup guy. Happy #YorkshireDay from me and my mate. Louis continues to earn high praise as a judge. A fan report from the taping said, "Even when disappointed by a performance @Louis_Tomlinson is constructive and finds a positive to point out. He has the makings of a great artist manager." They also said, "Even saying no and not liking a contestant performance @Louis_Tomlinson is unfailingly polite, fair and positive in his critique. He explains why he doesn't like it rather than just cutting them down." More positive remarks continue to show that Louis aims to be the constructive, caring judge. Having gone through the process himself, he seems to want to give the contestants the kind of support any contestant would hope to receive in such a nerve-wracking situation. Louis was the voice of the people tonight, asking the audience what they thought about certain contestants. He seemed to be enjoying watching the audience reactions to the contestants. Tip for contestants: You might want to make sure you call the judges by their right names. A contestant who had previously called Louis "Olly" got dissed by Louis. The contestant, who fan reports say was not very good, went to shake Louis' hand and Louis refused, shaking his head and moving his hands. 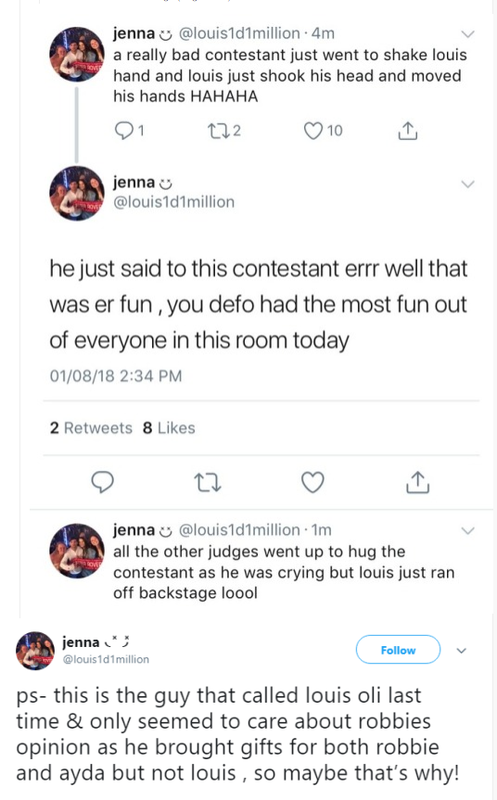 Later, the other judges went to hug the contestant who was crying, but Louis went backstage instead. Auditions are like job interviews - you have to know the names of the people who are judging you! 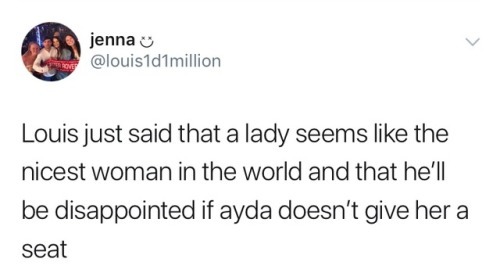 Nice girls finish first - Louis put in the good word for a female contestant, saying he'll be disappointed if Ayda doesn't give her a seat. Good news for the One Direction/boyband fans out there. Fan reports say both Louis and Robbie seem proud of their boyband roots. And why not! They were both part of very successful boybands! If you've missed any of our X Factor audition coverage, you can check out our X Factor Photos and Videos pages or read the wrap-ups from the nine days of auditions. Sadly, the Louies did not advance in Billboard's Fan Army Face-off, but Louis is on three of Billboard's charts. He came in at #3 on Billboard's Emerging Artists chart, #3 on their Social 50, and #70 on their Artist 100 chart. If all this music talk has gotten you longing for Louis' debut solo album, you can check out some of the already released tracks as well as some teasers that have been posted here.